“I’m sorry class, but we’re going to have fun today.” This is how teacher, musician, composer and game designer John Hunter starts his class in the 2010 documentary World Peace and Other 4th-Grade Achievements, which tells the story of how he uses his World Peace Game to help students work to solve global issues. In an age of smartphones and tablets, Hunter has had much success bringing his multi-level board game to classrooms all over the world. Tasked with using negotiation and problem-solving skills to get countries to work together instead of resorting to war, children spend hours going through the political simulation, working in “nation-teams” to do what diplomats with years of experience struggle with everyday. 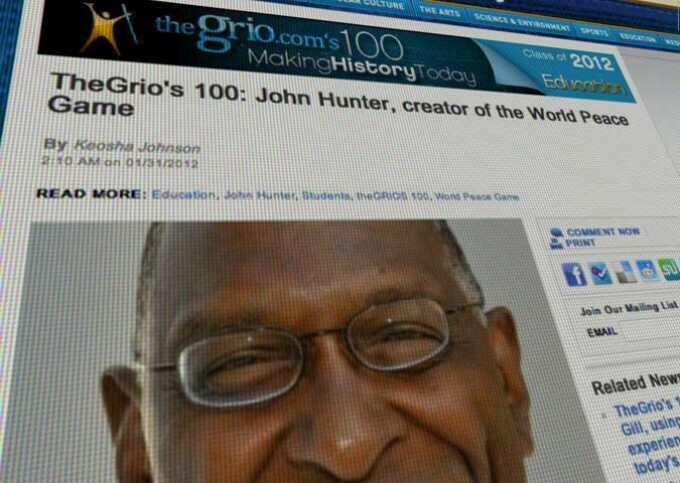 Hunter developed the game in 1978 while creating curricula for gifted students at an urban high school in Richmond, Virginia. “We were studying Africa, so I thought, ‘Why not put it on a game board?’ So I took the continent of Africa, divided it into countries, divided the kids into teams, and said, ‘Now what should we do with the continent? Well, there are a lot of great things, but let’s look at the problems and fix them, let’s solve things,’” Hunter said. Hunter has since updated the game from a two-dimensional game to a four-tiered Plexiglas tower, adding modern-day factors such as drone warfare. “The game is just a pretext, an excuse for us to develop compassion for others and to try and decrease suffering and increase the caring we have for each other,” Hunter said. John Hunter is making history … with his revolutionary game during a time of global tension. Hunter presented his game at the TED2011 Conference and has done the same in Norway, Austrailia and other countries. During his presentation at the Pentagon last November, officials there were so impressed with the game that they invited Hunter back, along with his students, to discuss it in more detail. Hunter had to quit his full-time position as a teacher at a Virginia school to travel and spread the word about the World Peace Game. He’s also working on a book about the game, which is scheduled for a 2013 release.